March of 1991 marked the twentieth anniversary of The Gospel Trumpeter. God has and is still blessing the printed page. 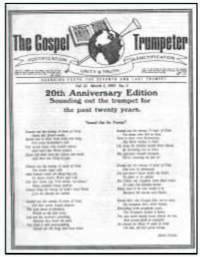 The Gospel Trumpeter was started in March of 1971 with the burden to proclaim the truth to the souls of mankind, and it is still published with that same vision. Many who once worked on this great endeavor are not with us, for they have gone on to their eternal reward. We, who are still on this side of eternity, have a big job on our hands, one that takes in every born-again Christian, and that is to stand for truth. Our commitment is to do our best by the grace of God to publish a paper that will reach out and strengthen the people of God and bring them to a closer walk with Him. of The Gospel Trumpeter office. Click here to read this issue and view the moving pictures.